The National Honor Society (NHS) is the nation’s premier organization that recognizes outstanding high school students. More than an honor roll, NHS honors those students who have demonstrated excellence in the areas of scholarship, leadership, service, and character. At Prior Lake High School, students who are academically eligible and interested in membership are asked to complete an information packet distributed to them in August. In addition, high school faculty members are asked to rate these students in the areas of leadership and character. Both the student packet and the staff ratings are then presented to the National Honor Society Faculty Council. This Council has five faculty members and is appointed by the principal. They are responsible for the selection, the discipline and the dismissal of all NHS members. Following their selection, the NHS advisor (who meets with the Faculty Council but is not a voting member) presents the list of selected candidates to the members of the National Honor Society Executive Board and the high school principal. Students are notified of selection results by letter. 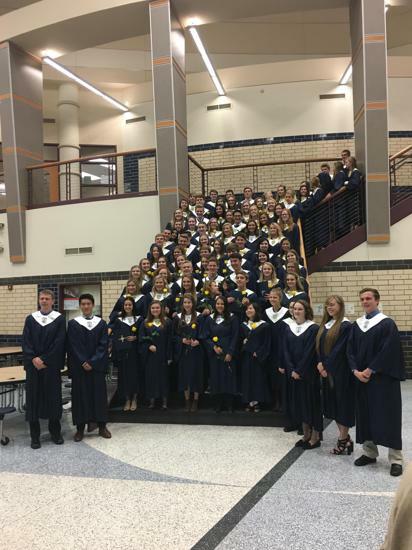 Membership in the Prior Lake Chapter of the National Honor Society is open to juniors and seniors who have been a student at Prior Lake for at least one quarter. The following four criteria for membership form the foundation upon which the organization and its activities are built. Students must have and maintain a cummulative grade point average of 3.4 to be eligible for membership. Is dependable in any responsibility accepted. In order to be considered eligible for membership, students must have a minimum of 30 community service hours in at least 3 different areas of service to be considered. Service hours cannot be part of a requirement for a class or other school club or organization here at the high school. These should be any activities outside of school in which you participated in the improvement of your community. Service hours cannot be overlapped with Leadership hours. ***Please note: Selection to National Honor Society is a privilege, not a right. Students do not apply for membership in NHS; rather they provide information to be used to support their candidacy for membership. This is not an election, nor is membership automatically conveyed simply because a student has achieved a specified level of academic performance. Students are reminded that to be selected for membership, they must show strength in all four of the society pillars. Prior Lake Senior High National Honor Society chapter is part of a larger organization which was originally established in 1921. National Honor Society, serves to honor students that have demonstrated excellence in the areas of character, scholarship, leadership, and service. Today, over one million students throughout he United States, Canada, and U.S. territories participate in the activities of NHS. Members of the National Honor Society are not only recognized for their excellence but are also challenged to further develop through active involvement in school and community activities. The PLHS chapter of NHS is currently run by advisor: Ms. Lecceardone-Brown. The chapter also has five officers: Katelyn Glaser (president), Bo Claymore (Vice-President), Dain Benson (Treasurer), Ryan Wade (Secretary), and Melissa Pfeiffer (Historian).